MiniBible is a free offline bible reader for the Harmattan (Maemo 6/MeeGo) based Nokia mobile phone N9. It supports currently more than hundred bible translations in over fifty languages. 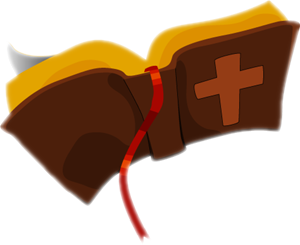 The bible translations are provided by the SWORD Project free of charge. The names of the 66 books in the bible can be shown in another language as the currently selected bible translation. This way you i.e. can read the bible in German while still using the English book names. Currently the book names are available in 20 different languages. Whit QML and Swipe gestures it supports the latest UI invention of Nokia. This is an incomplete list of the supported bible translations. A complete list is available at http://www.crosswire.org/sword/modules/ModDisp.jsp?modType=Bibles. MiniBible is provided under the GNU Public Licence (GPL). Feel free to contact me if you need help, found a bug or have a suggestion. Note: This might not always be the latest version. Feel free to contact me for the latest version of the source code! I’ve recieved the updata of a new minibible version(0.9.71), but I failed to update with it, and either can I find that version on this website, so I want ask you that if this version gernerated by you? If it is, would you please tell me that where can I get this new version? I love this app, I’ve been using it for almost three years since I began to use N9. May God bless you for your awsome work. I have not pushed any update. It must be a failure of the Store System. I am not working on MiniBible anymore as I don’t use my N9 anymore. Hello! George, do you think is possible to have on N9 other romanian translation of the Bible? Now we have RCV and RCCV, but how about the Sinodal Romanian version? Thank you! A good day! How ever if you have a translation which is packed in the standard Sword module, you simply can extract it to the MyDocs/Sword/ folder. You will se other modules which have the same folder structure. After a restart of MiniBible it should be available in the list. The plain files will be automatically generated on first selection! No, I am not planning do port it to Jolla. Wow, awesome blog layout! How long have you been blogging for? you made blogging look easy. The overall look of your site is great, let alone the content!. Thanks For Your article about MiniBible | Digital home of George Ruinelli . Thank you for your work on this app. How can i use gerhfa2002 with it on my n9? The HFA is not supported since it is a locked module. Thank you so much George! It worked very well. God bless! If it is a standard Sword module, you simply can extract it to the MyDocs/Sword/ folder. nope, one of the recent updates fixed this 🙂 Thanks for your work! Can anyone help me to get nepali translation bible. Can you install other software? MiniBible uses only dependencies which are provided by Nokia, so it actually should work without issues. Let me know and I will try to help. Yes, it’s still there. Ever since I upgraded to PR1.2. I can install every other software I want to though, from SOVI or somewhere else. Is there any way to manually install the dependencies? like apt-geting it? Sorry for the late reply, I did not see your message. 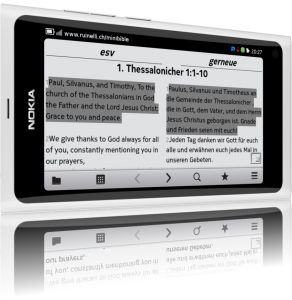 Kindly let us have the link to download bible translation for Nokia N9. I have already installed the minibible on my phone. You may even turn the list under “Supported Bible Translation” into links to those downloads even if they are premium sites. Some people can pay for others to download free. You have to download the bible translations from within MiniBible. Open the menu and go to Settings > Add/Remove translations.